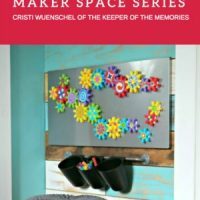 I’d like to introduce you to Cristi Wuenschel of The Keeper of the Memories for today’s Maker Space Interview. 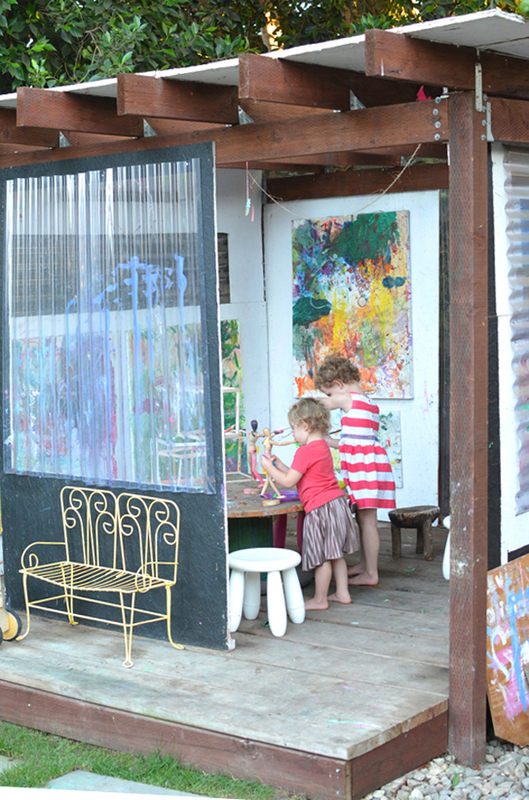 I was initially struck by how well organized this studio is, and was then blown away by Cristi’s ingenuity in turning a porch into a functional family art studio. 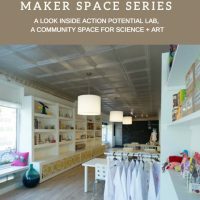 This is part of the Tinkering Spaces series of informative chats that center on designing kid-friendly creativity spaces, or tinkering spaces. 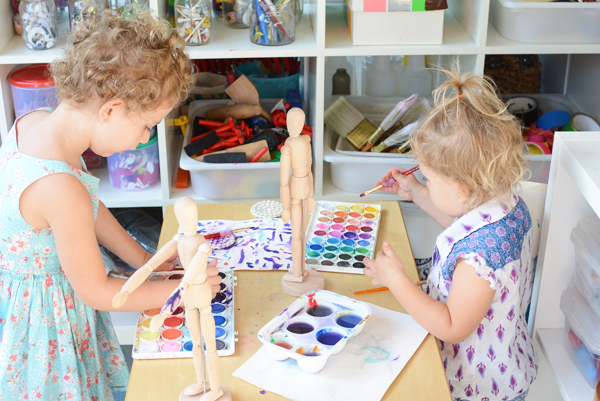 If you can’t figure out where to put your children’s art materials, need a plan to turn laundry room into an art room, or want inspiration for making your art classroom shine, these interviews are sure to give you food for thought. Welcome, Cristi! 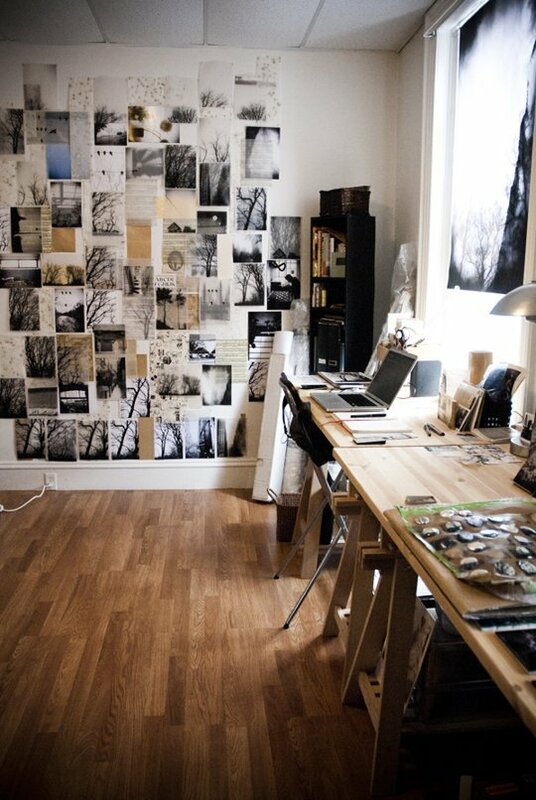 I adore your bright, clean, and incredibly organized studio and I’m so glad you’re here with me today. Can you start by telling us about your family? It’s just the three of us right now. My husband, the little guy, and me. My husband is the entrepreneurial type who also happens to have a knack for all things engineering. If you can dream it, he can design and build it. I’m the creative one. I love mixed media & art journaling as well as scrapbooking. And E just turned two. He’s definitely a mover and a shaker, but most toddlers are. He loves books, art supplies, and puzzles. 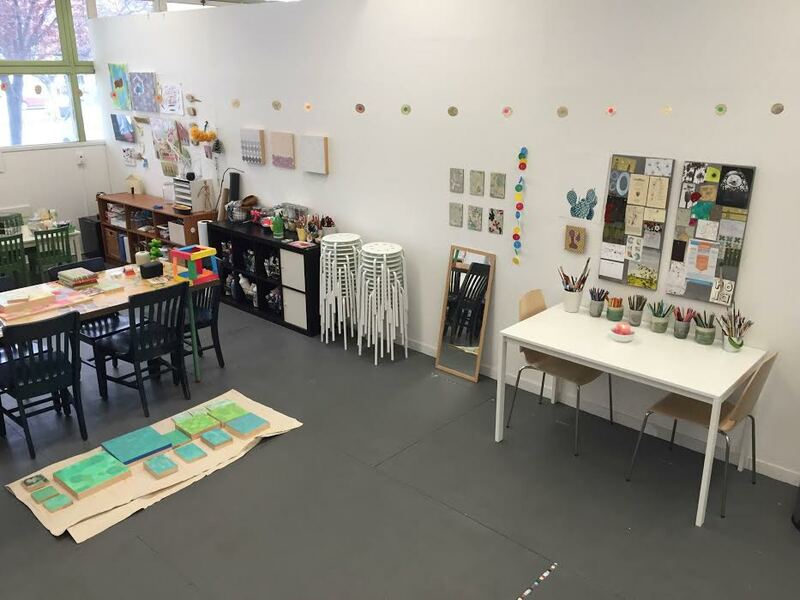 Your creative space is so inspiring! Can you describe it for us? Sure. The studio is approximately 12ft. x 24ft. and was designed and built by us, so a true labor of love. 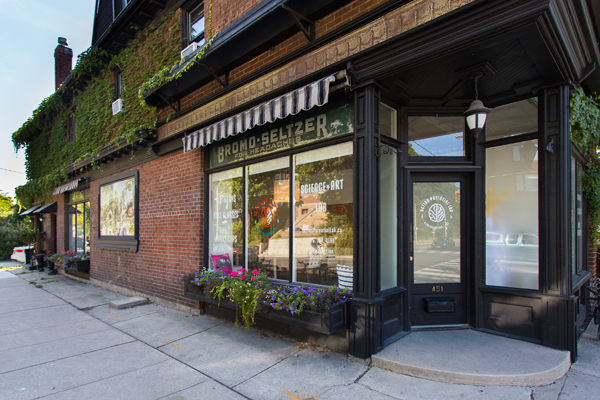 It took us about a year from breaking ground to wrapping up. I worked right alongside the guys in the pouring rain helping to prep the footer the night before the truck was due to pour the foundation. Way to wait until the last minute, right? And I can’t even begin to count how many nights my husband and I were out there well into the morning painting and sanding and trimming. Lots of awesome memories. And lots of arguing over windows and trim… All in good fun, though. My original space was a spare bedroom, which ended up being E’s room, so we had to figure out something else, preferably sooner rather than later. I’m sure you know how that goes. We talked through our options and decided to redo our existing enclosed porch and turn it into a sunroom, which would ultimately be my studio. And then I had the little guy and he started spending a lot of time in the studio and somehow it ended up being less mine and more ours. No surprise. Although things seem to spill over more often than not, the little guy’s half is fairly straightforward. Mine is a bit more like organized chaos, but there really is rhyme and reason to it. I swear. 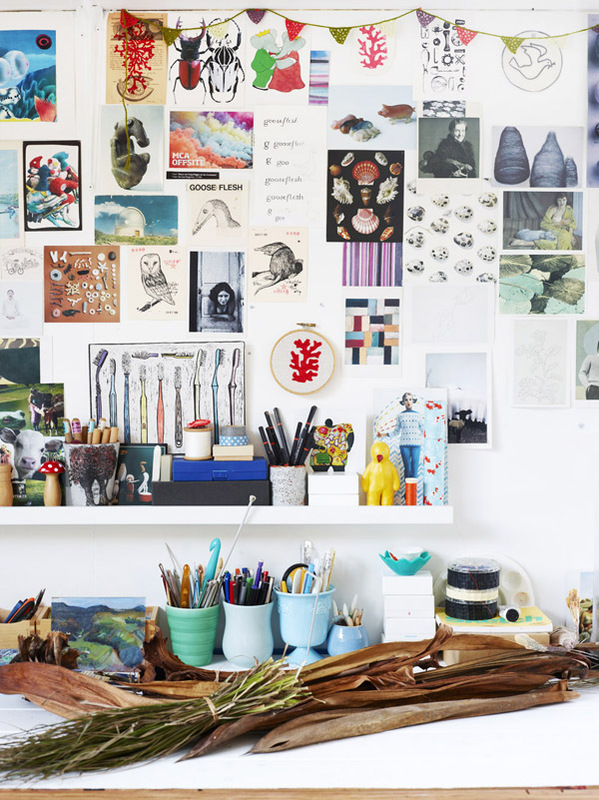 What do you think makes your creative space unique? The distressed plank wall! Everyone loves it. There’s actually a really funny story about the plank wall. I hated it. I’m talking ready to tear it all down and start over hated it. Either that, or give the entire studio a bath in white paint. It was that bad. My husband convinced me to give it some time. You know, because he thought it might grow on me. Yea, it did. Sort of. I ended up spending several hours with a power sander distressing it until I was happy. Needless to say, that was a long process, but so worth it. I adore the look of the distressed wall! It brings so much personality to the space. What else do you love about your space? I love having everything organized in a way that I can find exactly what I’m looking for. Our creative space has been a work in progress for what feels like forever, but it’s finally at a point where I’m more or less happy with it and calling it done. Although, that’s relative because when is any studio ever really finished? I’m one of those people who has to be able to spread out as well as leave things out. That’s just how I create. When I started planning things, I made a point of creating separate workspaces. 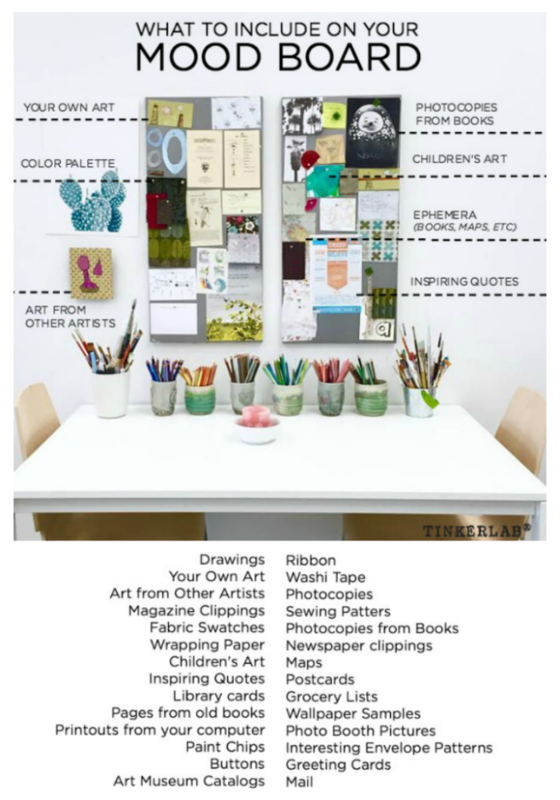 I have a mixed media & art journaling workspace as well as a scrapbooking workspace. And most of the time, things still end up everywhere and that’s fine with me. E is almost always into something and, for the most part, I let him have at it… Even if that means he’s wrecking all kinds of havoc on my stickers, which seems to be his favorite thing to do. I bought him his own, but mama’s are obviously a lot more interesting. That’s just how it goes when you’re sharing a studio with little ones and you know what? It’s awesome! I love each and every one of his projects. There really isn’t much that’s off limits. I want more than anything else to encourage creative thinking and problem solving skills, which means I’ve made a point of giving him free access to as many supplies as I possibly can. Take us to a moment in time in your space. What does it feel like? The early evening hours are almost always magical around here. That’s when the little guy’s side of the studio gets the most awesome, natural light and it’s also usually when we get home and sit down together. Sometimes, we make stuff. Other times, we read. Either way, it’s our time together and I wouldn’t trade it for anything. It’s serene, to say the least. I know that probably sounds crazy, but it’s one of the few times during the day that my rambunctious toddler is anything but. 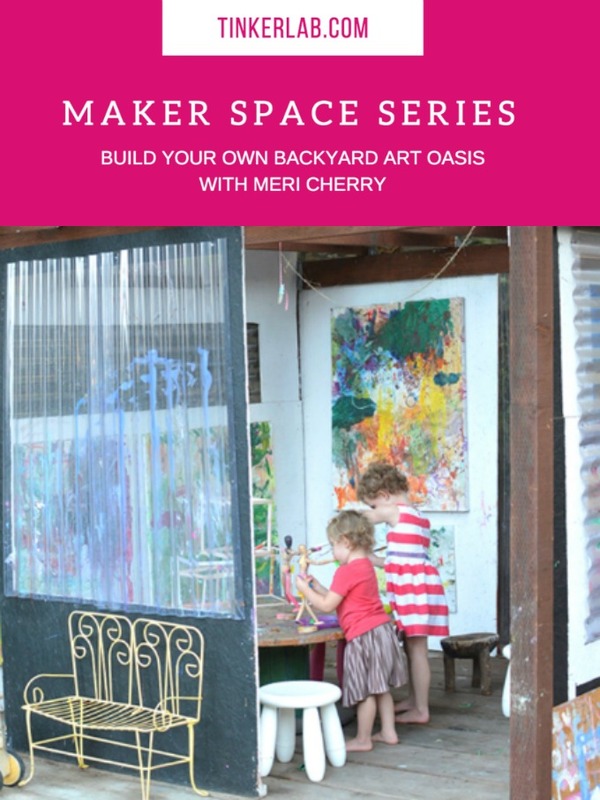 Do you have any tips for those of us who want to make our homes havens for making? Take your time. Plan your space. 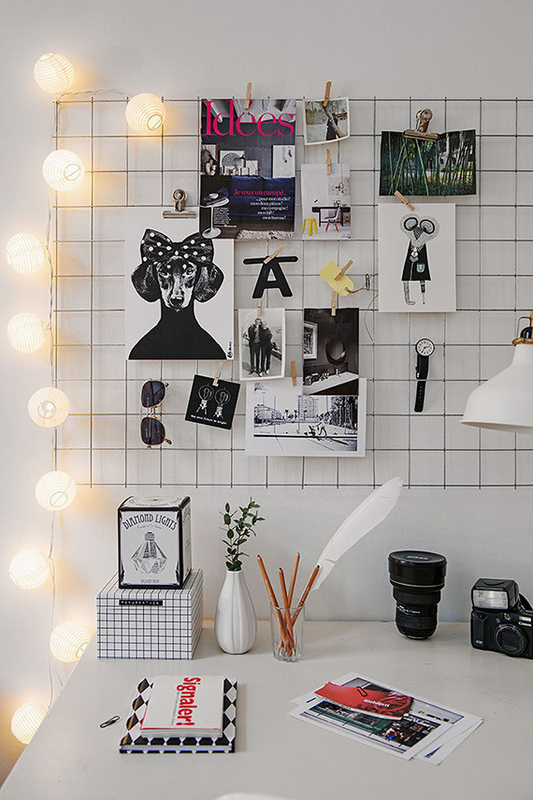 Create an inspiration board. Have at least an idea of what you need versus what you want before you buy anything. Ikea is awesome for inexpensive, high-quality furniture. 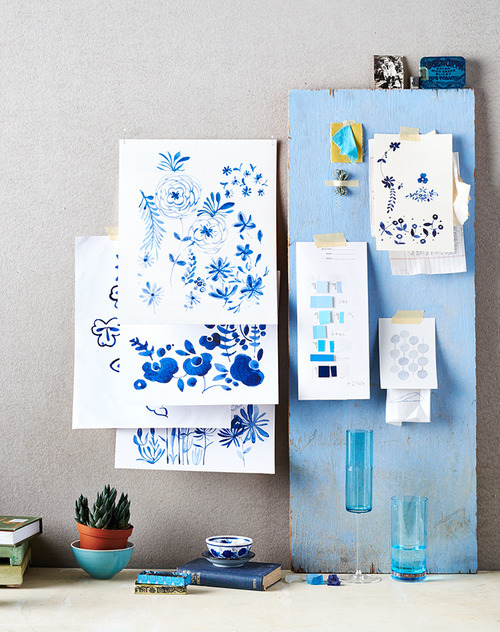 And if money is an issue, repurpose what you already have and don’t forget that a can of paint goes a long way. I’ve spent years piecing things together. My sawhorse desk and Copic organizer were both handmade gifts from my dad. My husband and I built the galvanized pipe workbench. Everything else has been bought a piece or two here and there when things were on sale or with a coupon. It’s totally doable to create an awesome space on a budget. Another thing to keep in mind is how old your little ones are. If you have really little kids, you have to be a lot more careful what you keep within their reach. As it stands, all of E’s stuff as well as all of my paper and our washable art supplies are on lower shelves. Anything sharp or permanent or that might be a choking hazard is stored a lot higher. What three supplies are indispensable to you and your children at this moment? Choosing only three is almost impossible. Paint. We can’t live without paint around here. At least I can’t. And paper, but not just any paper. It wasn’t all that long ago that I put together an art journaling kit for the little guy with a Strathmore visual journal. It’s a 5.5×8 mixed media spiral-bound journal. When he fills it up, I’ll date it and put it somewhere to keep. That’s his journal and he knows it. He loves markers too. I swear we have just about every kind of marker that Crayola makes and every now and again he still somehow ends up with a few of mine too. 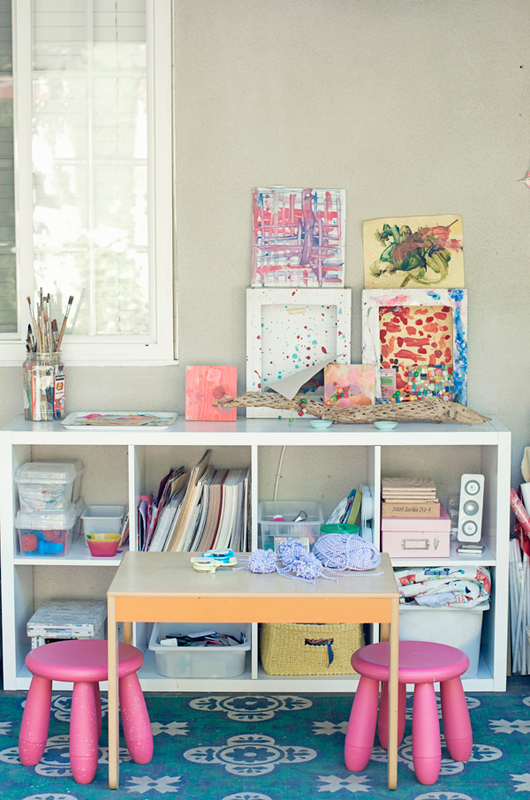 Can you share a favorite tip for organizing your creative zone? I have so many. 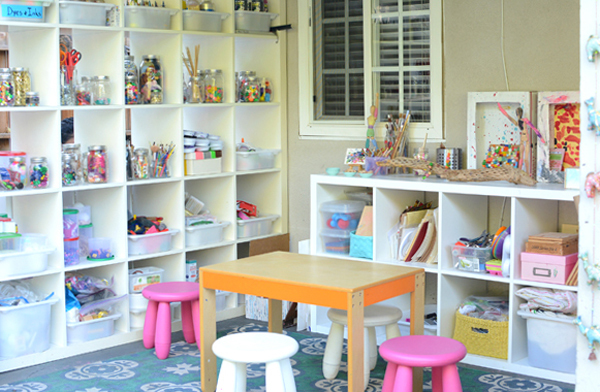 I write a lot about organizing on my blog and especially organizing creative spaces. Probably my favorite tip would be finding an accountability partner or getting organized via a group. I currently host an organizing challenge on Facebook and the community within that group has grown so much over the last several months, so I guess there really are a lot of creative mamas who believe in the power of working together to get organized. 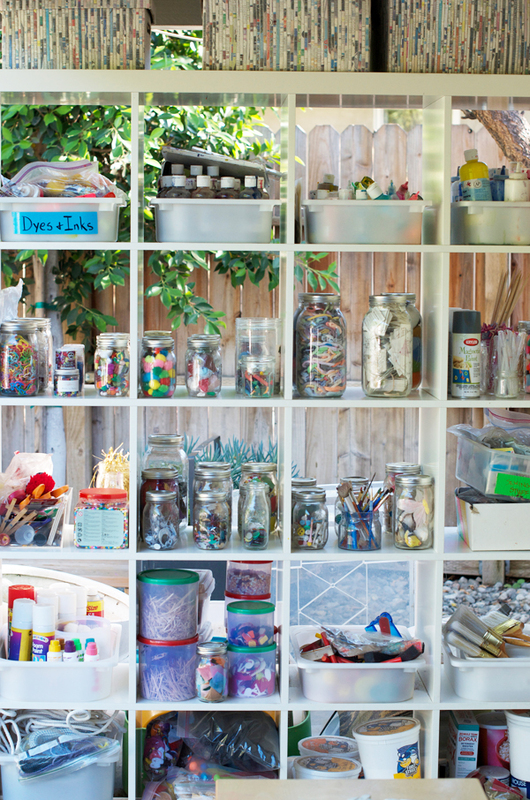 Do you have a favorite tip for cleaning up after a creative session? The little guy mostly works on trays and I usually work on mats. It definitely helps to keep our messes somewhat contained. He loves his trays and I find it absolutely hilarious that if I get out something that’s messy or has lots of loose pieces (blocks, Play-Doh, etc. ), he automatically goes and gets a tray. It seriously cracks me up! He totally gets it. I also keep baby wipes and a roll of paper towels as well as Windex in the studio. All of which are obviously out of his reach. Projects in progress are kept out. Messes get cleaned up as we make them. What do you wish for your son to remember about his childhood? I want him to always remember how much he means to us and to always have a love of learning. I know he won’t remember many details about these early years, but I hope for him to at least remember spending time with us and making stuff. Maybe, that means building robots with daddy or creating art with mama. Either way, I hope he never forgets how important just being together is. If anyone’s interested in joining the 52 Weeks Workspace Challenge, you can find us on Facebook here. Thanks so much for having me, Rachelle! 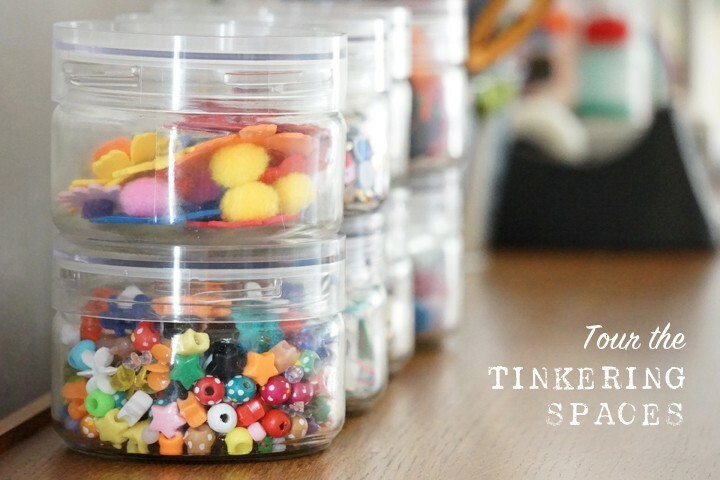 I love TinkerLab and I love talking about organizing creative spaces! Thank you for inspiring us today! 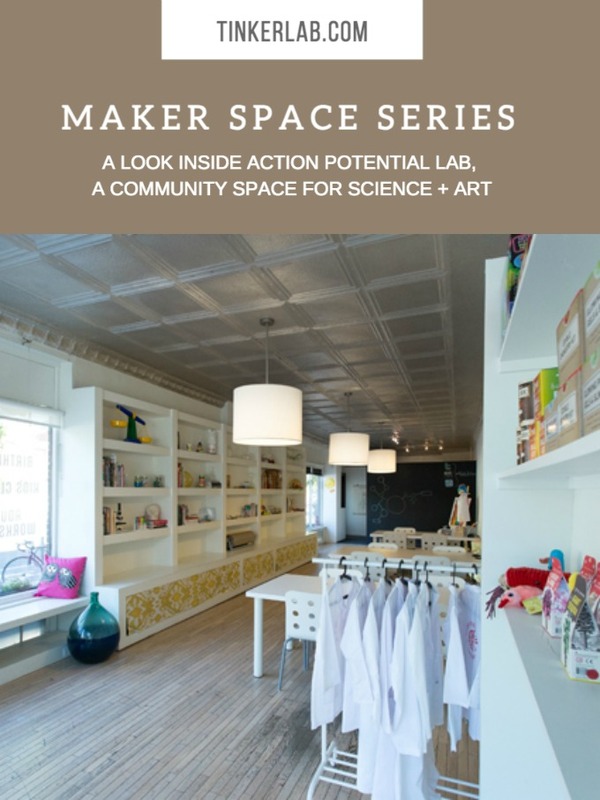 To see more spaces from the Maker Space series, click here. Cristi Wuenschel is The Keeper of the Memories and a first-time mama to her little guy who just turned two. 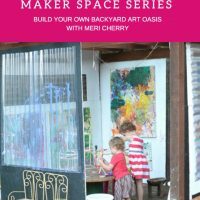 She writes about organizing creative spaces, documenting everyday life, and awesome stuff to do with little kids. 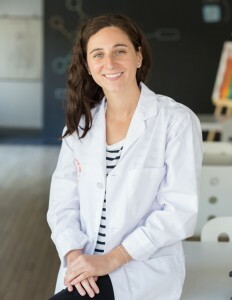 Cristi is an Early Childhood Education Teacher with a passion for anything and everything art and science. 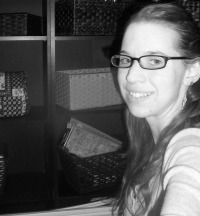 And of course she spends most of her free time in the studio making stuff. For more inspiration from Cristi, you can find her on Facebook and Instagram. 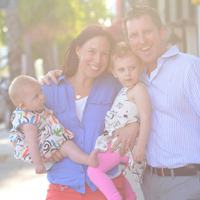 Today I’m joined by an inspiring Silicon Valley couple, Ilan and Hillary Frank, two active, working parents with demanding careers in the tech scene, who also make an effort to dedicate as much of their “off time” to making great, creative memories for their family. 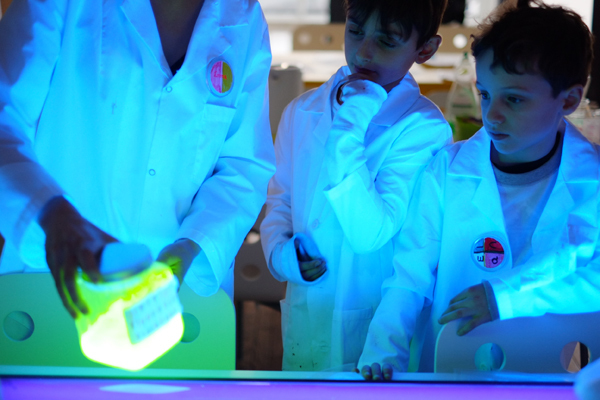 I was smitten by their fold-away STEAM table and asked them if they’d be so kind to share it with us here. Hillary refers to Ilan as a “Renaissance man” because he’s able to fix a plumbing issue around the house, bake an unbelievable banana bread, make sure there is a thriving vegetable garden in the backyard and still have time to help the kids with their school projects. She attributes this partly to his childhood on a Kibbutz in Israel – where he had to figure things out and make use of what resources he had around him. 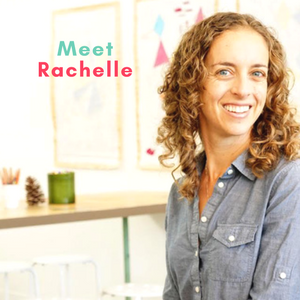 Their 3 children are ages 9, 7 and 4 are natural “makers’, who are often found creating new games, baking, playing sports, and exploring in the backyard. 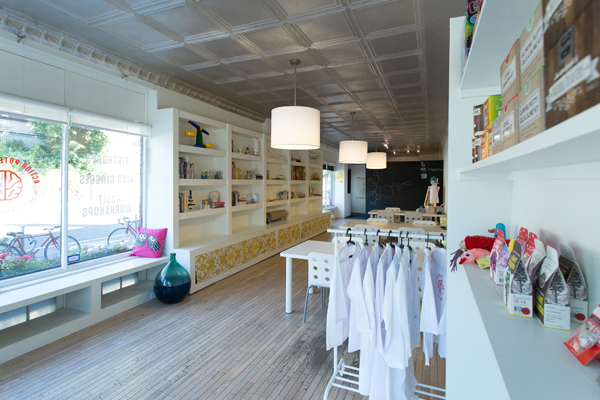 In the entrepreneurial spirit of Silicon Valley, with money earned from selling eggs from their backyard chickens to neighbors and friends, they earned enough to purchase their wii game console. 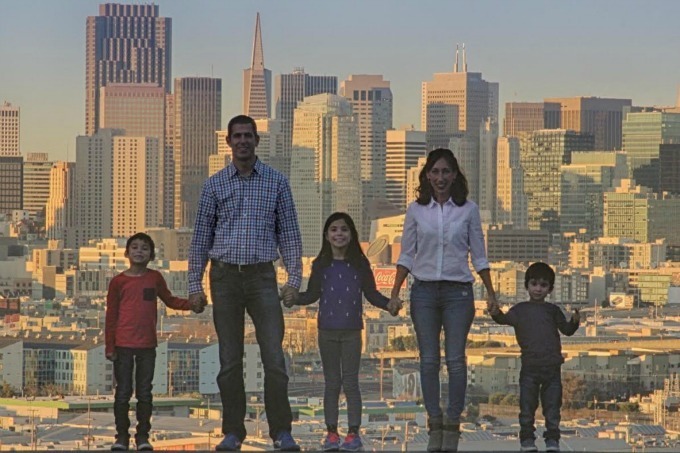 Ilan and Hillary are clearly big believers in teaching their kids to spot the opportunities in everyday experiences. They encourage their kids to seek any chance to learn from what’s around them and that by doing this, that they’ll discover their own individual talents. 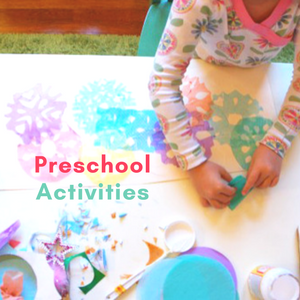 They lean towards play-based and project oriented learning and believe that encouraging their kids to embrace the unknown, have fun while trying new things and support each other is the key to strong problem-solving skills for long-term success. The STEAM room is just one element to how this family has set up these opportunities for their children. 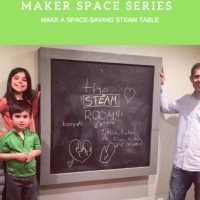 Without further ado, let’s find out about their cool space-saving STEAM table. We are a very busy, active and happy family of 5. Our daughter, Talia, is 9 and her brothers Eytan and Ari are 7 and 4. With two working parents – we clearly have a lot going on! We think of ourselves as a family of makers and love that our kids also thrive when they’re building. This “builder” mentality stems from Ilan who was born on a kibbutz and grew up solving problems. Your folding STEAM table is so inspiring! Can you tell us where the idea came from? 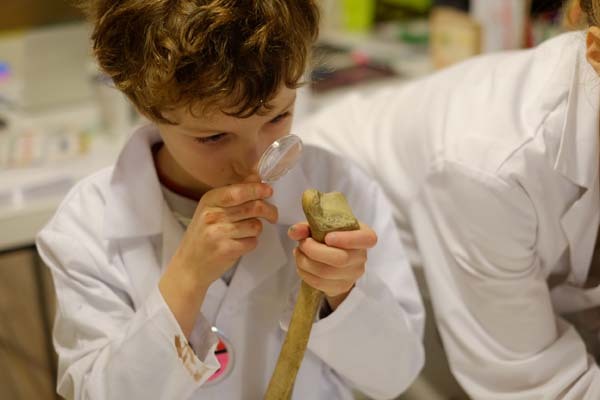 Our children are very curious, love to experiment and are also extremely social kids. 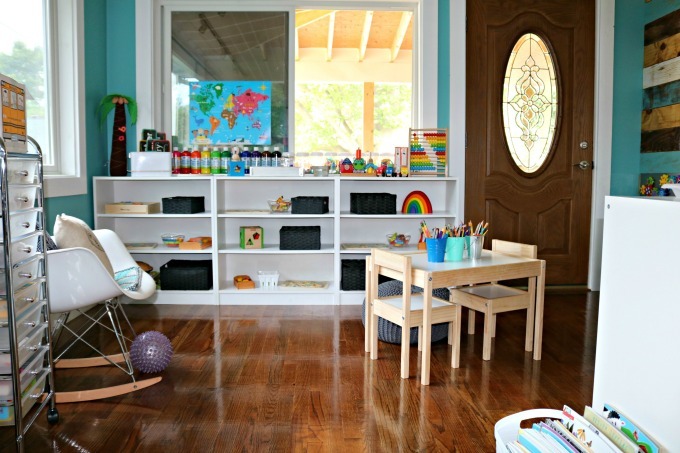 We knew that as they grew up, we wanted a space for them that could allow for them to work on projects and play with their friends. We also need a usable guest room for out-of-town guests. At first we considered a murphy bed, but then thought, why not a murphy table? Prior to making your murphy table (I love that! ), where did your children do most of their making? Our kitchen was the most obvious place the kids were first “making”. Whether it be home-made play-do, lip balm, brownies, art, etc. 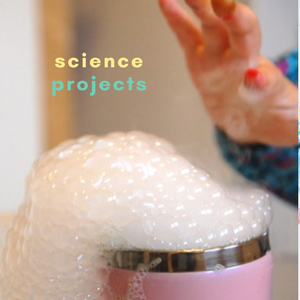 – the kitchen table was definitely the epicenter of our kids “experiments”. We’d find that our daughter (self-proclaimed “mad-scientist”) would find any opportunity to conduct baking experiments found on YouTube. Our boys would repurpose a cardboard box and make it into a TV that they could use as they put on a show inside it – or a car to “drive” complete with Tesla logo. They are Silicon Valley kids after all. What impact has the new murphy table/STEAM room made on your family? 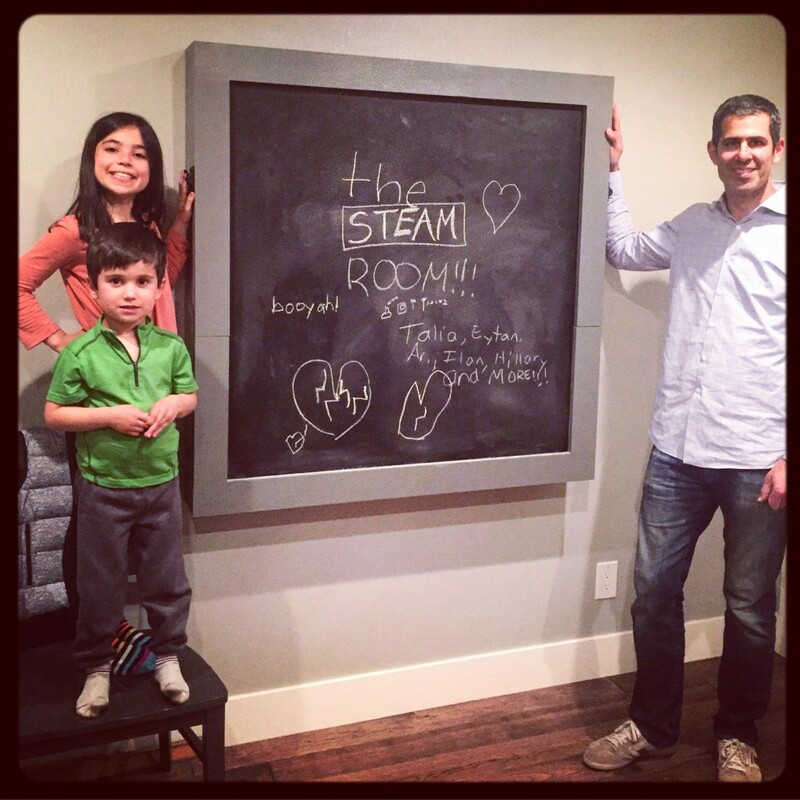 This STEAM room has been such a fun element for our kids – and pretty game changing for our family. First – it’s now part of the official “home tour” that they take their friends on when they come for playdates. It’s awesome to see how proud they are of the STEAM room. 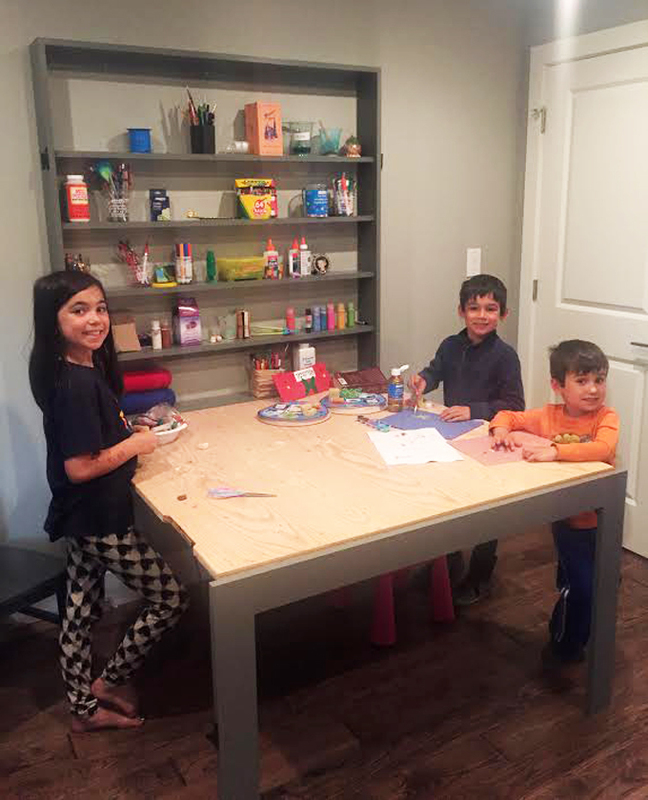 They should be – they got to use the power tools during the construction of the table! 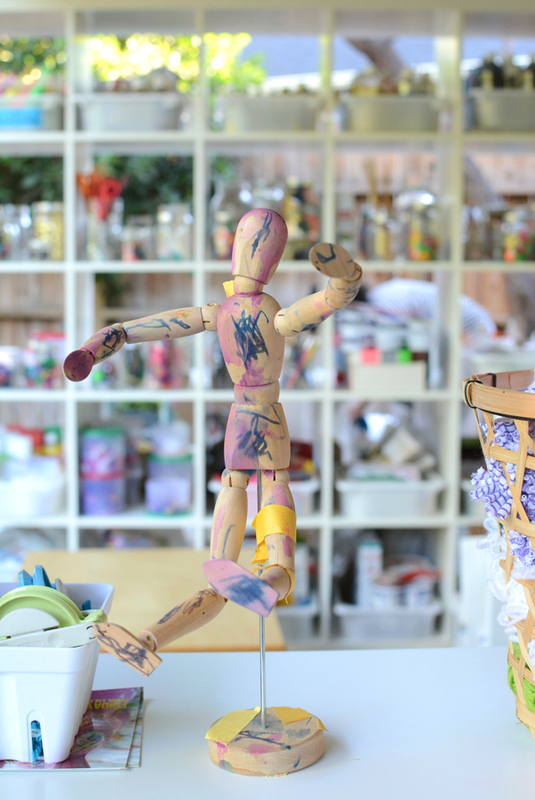 Also – it’s a place for the kids to play and experiment without the worry that their projects (that might span several days) would need to get moved/cleaned up. 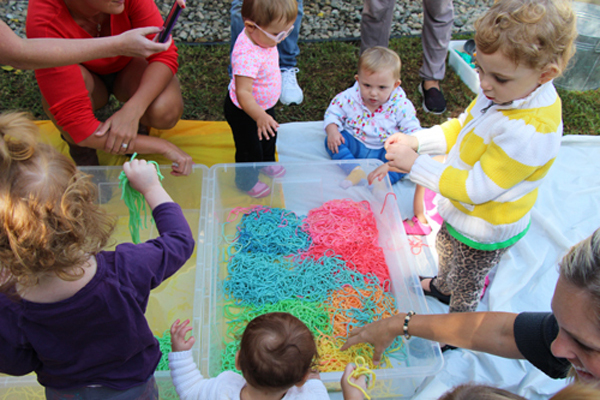 They can get messy and that’s part of the fun! Where do you store supplies? 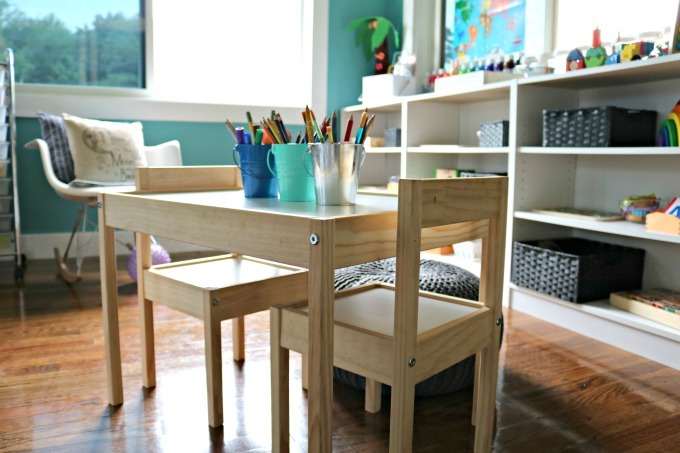 For the most part, the art supplies are inside the storage compartment within the table. They are hidden and out of the way when the working table is up – but completely available to them when working on a project. 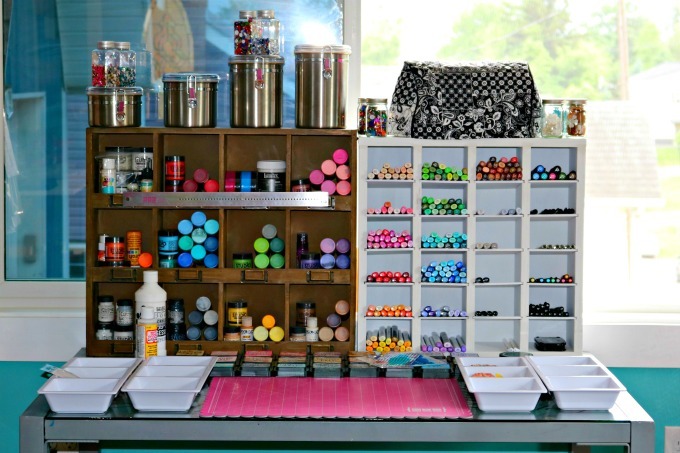 We also have a desk inside with larger storage bins with larger art supplies. 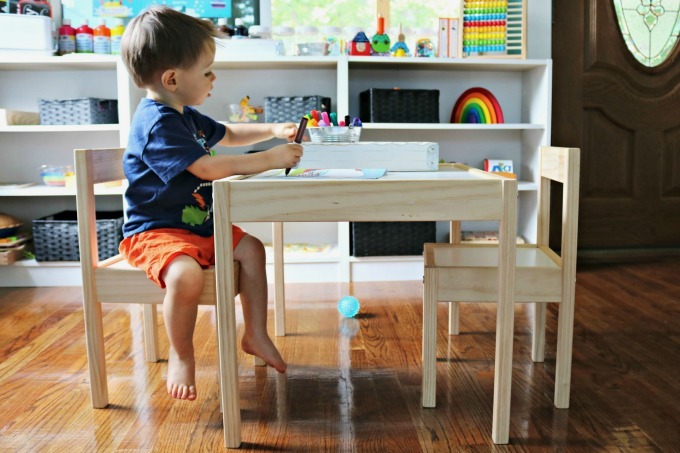 Do you have any tips for those of us who might want to build a table like this? 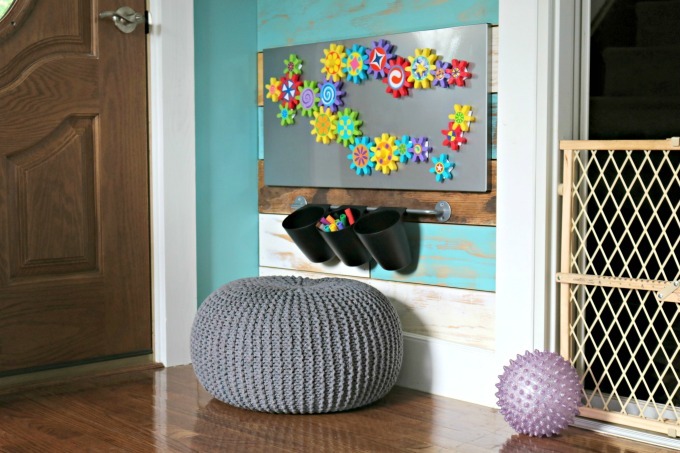 The supplies were all sourced from Home Depot with the exception of the thin metal sheet used as the magnetic blackboard sourced from Alan Steel & Supply Company. A miter saw, table saw and electric sander came in very handy. 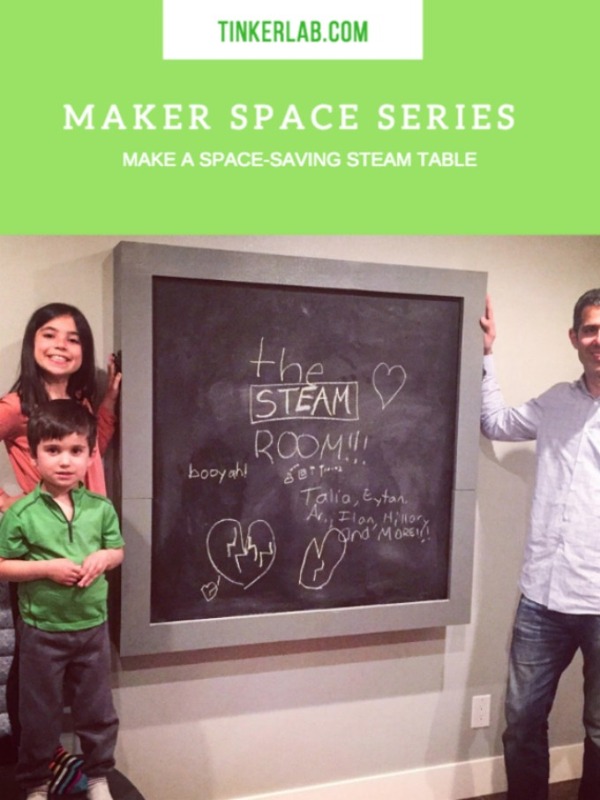 Keeping a maker space tidy can be hard for many families. 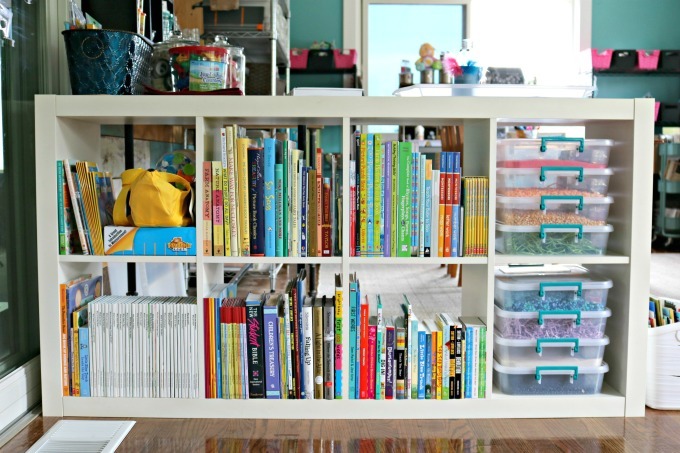 Can you share any favorite tips for organizing supplies or cleaning up? This is an area we haven’t quite mastered in all honesty. Between providing fun storage containers and incentives built around bi-weekly cleanups – we’re still finding serious nudging for keeping the room/table organized and tidy necessary. If you had to be selective, what three things do you love most about your STEAM space? 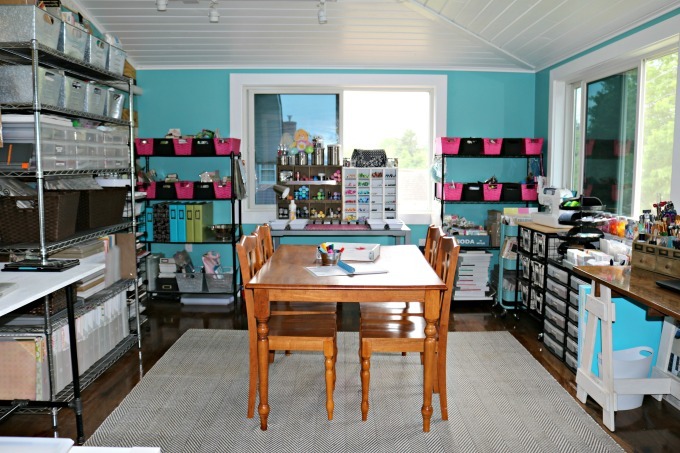 We can store a lot of cool art supplies easily and have access to them when we need it. 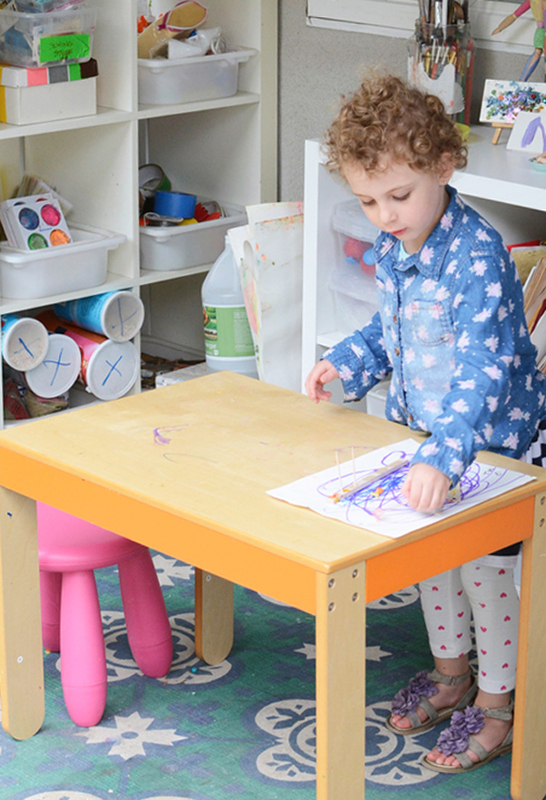 The table converts into the perfect workspace for our kids and their friends – the table top is made of sanded plywood which makes it safe for kids and good for messes (which are encouraged). The table folds out of the way when we need to use the room for out-of-town guests staying over. 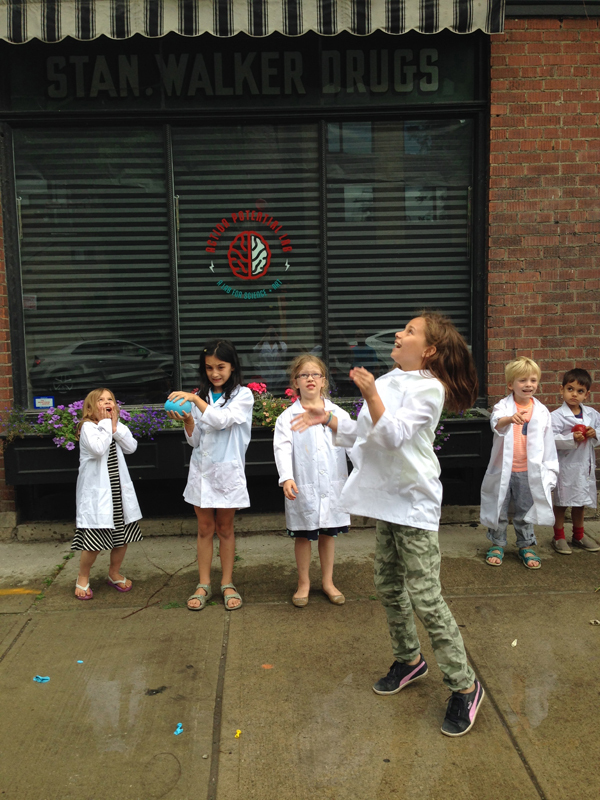 Measuring cup/spoons – our kids have discovered recipes for play dough and slime. Cardboard – for creating everything from bridges to stages for puppet shows. What do you wish for your children to remember about their childhood? That they felt free to be creative and get their hands dirty and that they can fix anything from software to plumbing. 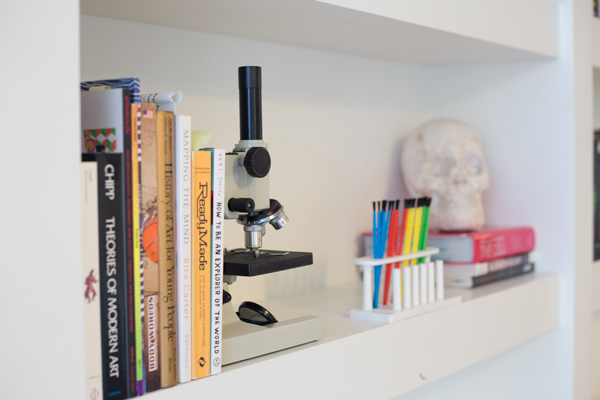 We are strong believers in making sure our kids are given every opportunity to succeed – and to us, that means that they have the space to experiment, fail, try again and figure things out. 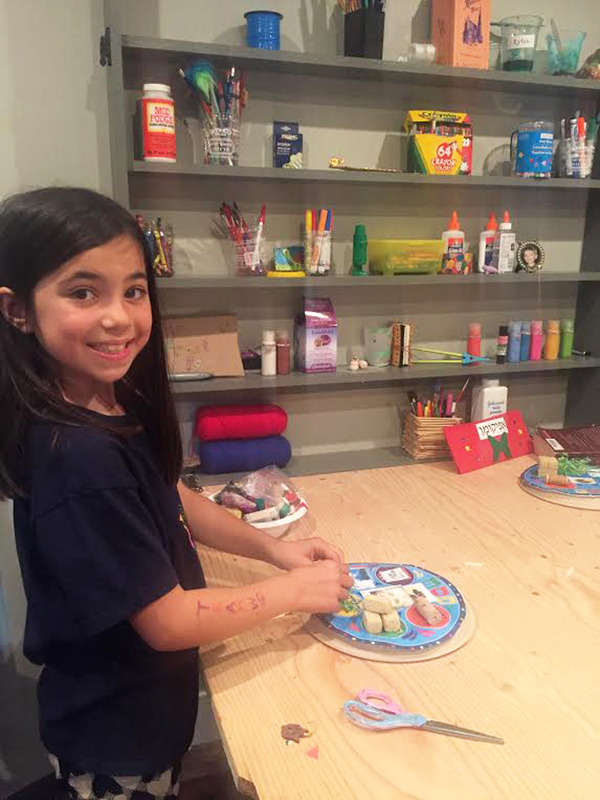 That’s what the STEAM room is really all about – setting up the space for our kids to be creative and have fun!. 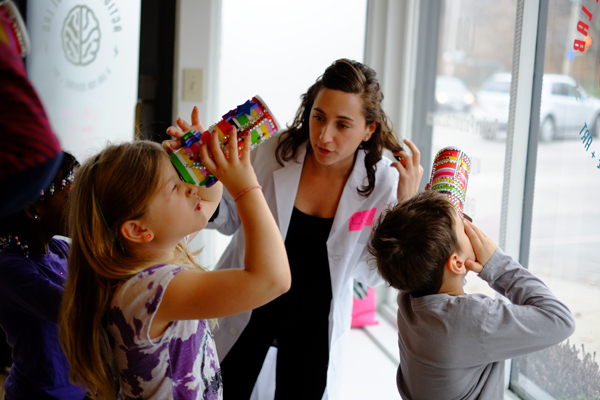 We want our kids to think of themselves as problem solvers and find ways to make something from nothing. They’re having a blast and we can’t wait to see what else will come out of that STEAM room! 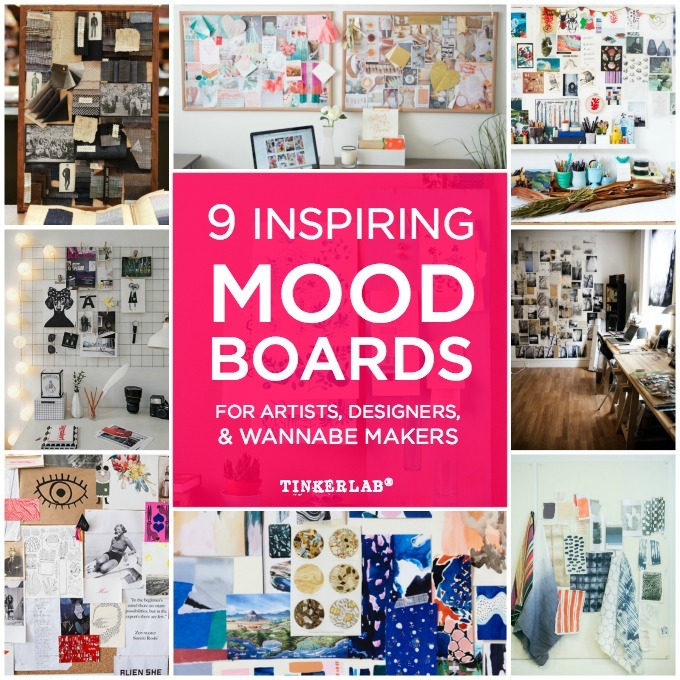 Yesterday I shared how to create a mood board that inspires creative energy, and today I have 9 inspiring mood board examples that I know you’re going to love. 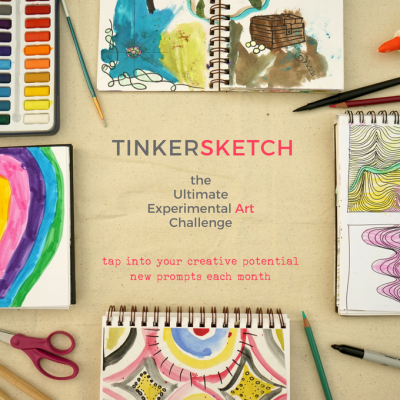 If you’re an artist, designer, creative parent, or aspiring maker, these ideas are sure to get your creative juices flowing. I’ll add links so that you can scoot off and see more from each of these artists and designers. 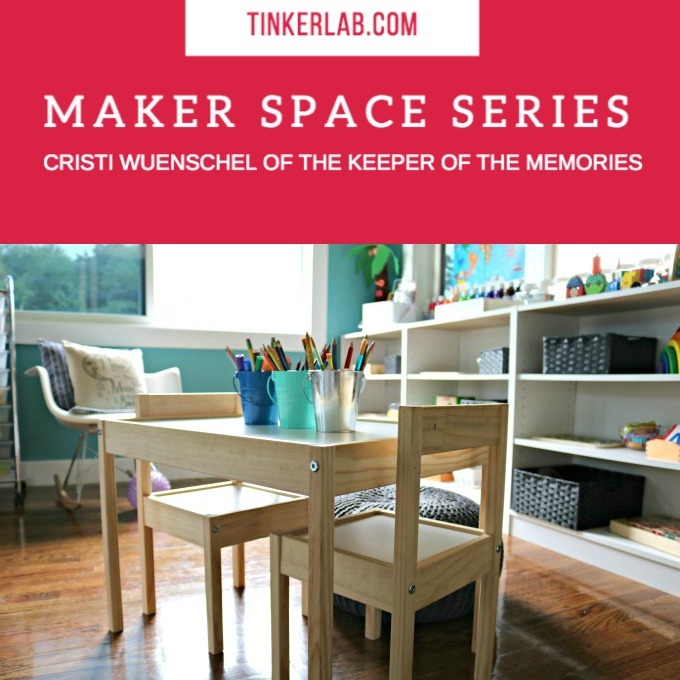 For more tinkering spaces inspiration, you don’t want to miss the Tinkering Spaces series. 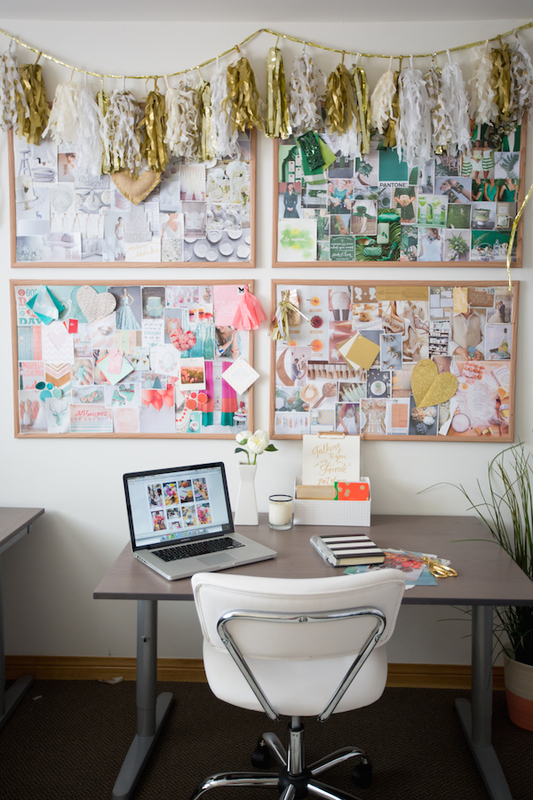 A different mood board for each project from Inspired by This via Glitter Guide. Natural materials inspiration from Helle Jorgensen via The Design Files. 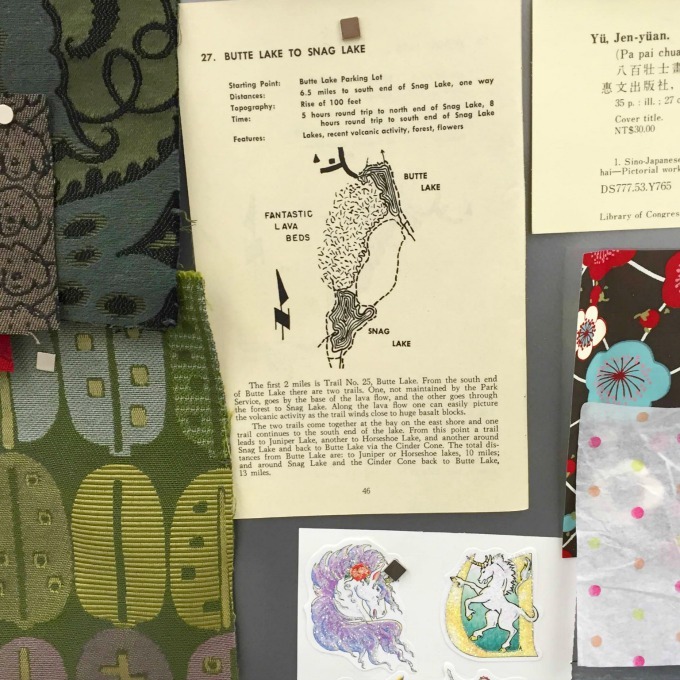 Helle’s page of collections is inspiring to anyone attracted to ephemera. 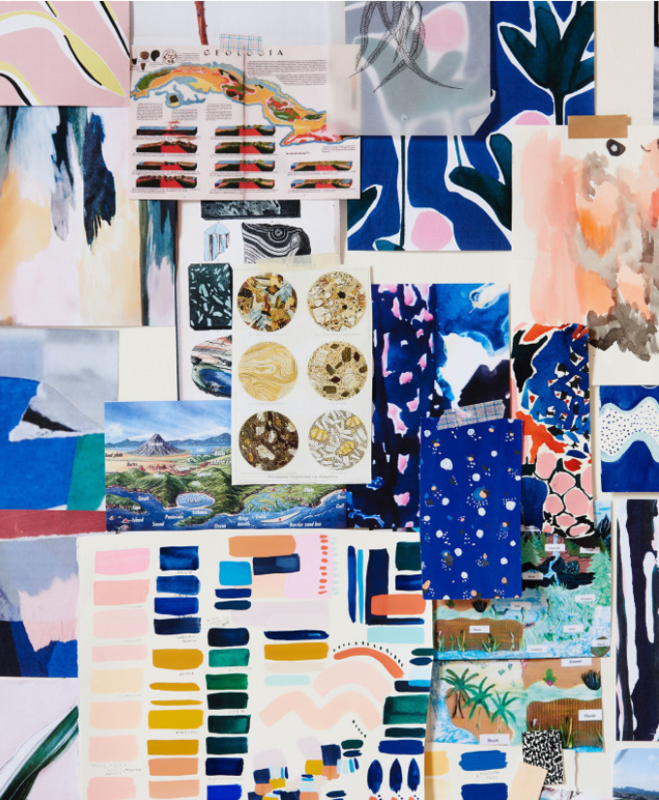 Are you interested in surrounding yourself with images that inspire more art-making? 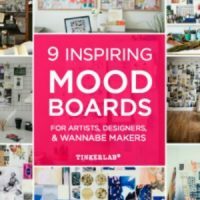 Could you use some ideas on how to make a mood board? 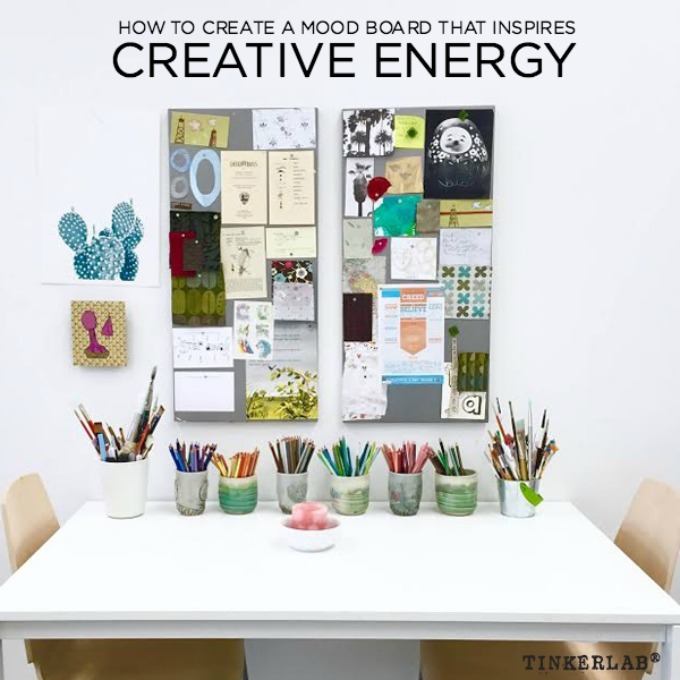 Here are five tips that are sure to help inspire more creative energy. 1. Begin: Start with a board. 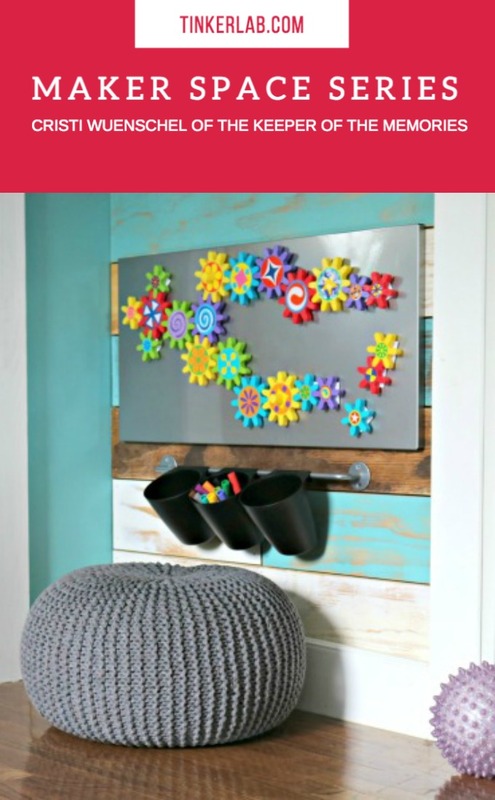 This could be a cork board, magnetic board, canvas frame, or a blank wall. It’s entirely up to you. 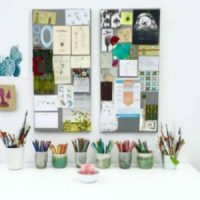 I prefer to use a magnetic board because the magnets allow me to preserve the integrity of the collected objects and treasures (no hole pins or tape tears!). 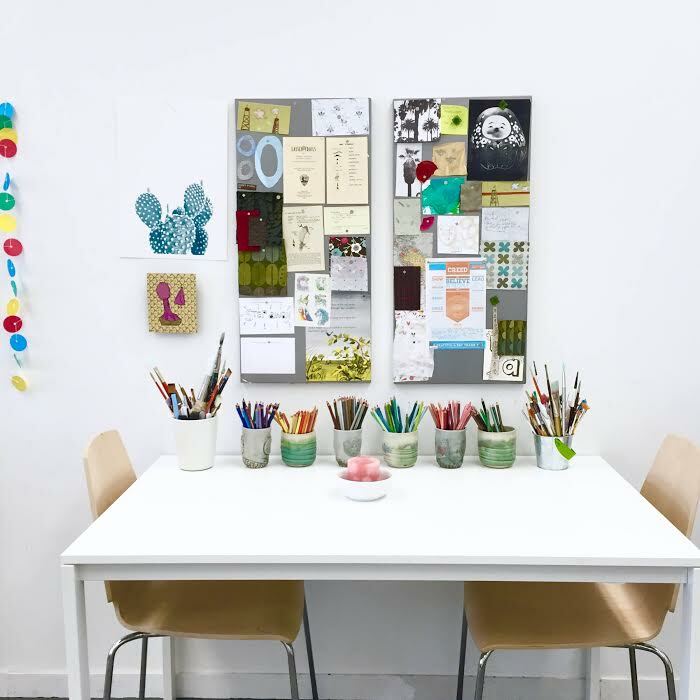 I used two of the Spontan magnetic boards from IKEA (shown here). For magnets, my favorites are Mighties (Amazon) and Mighty Magnets (Container Store). Use caution with mini magnets around small children. Gather images that inspire you. 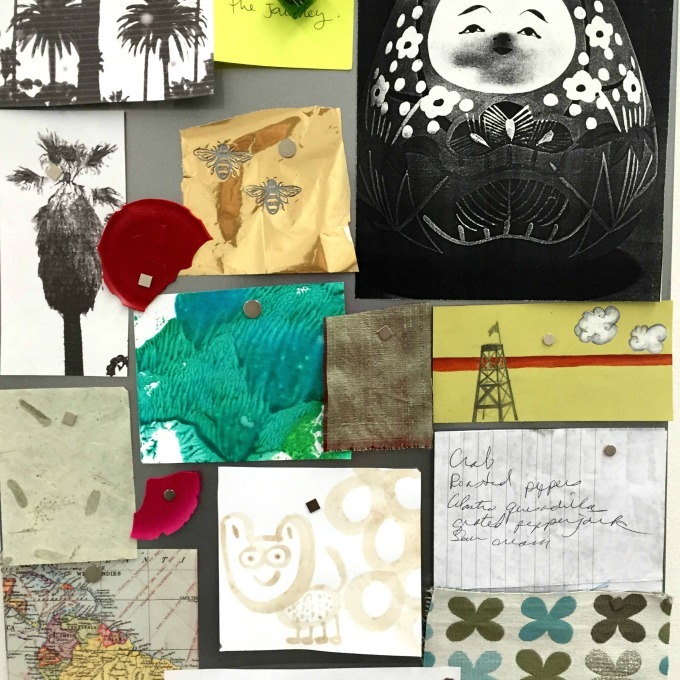 These can be magazine clippings, doodles, photographs, fabric swatches, paint chips, quotes, and found objects. I’ll include a list of things you can collect for your board (below) and as a printable. It will inspire you! Arrange the images and objects. Line them up in a grid or overlap them artfully. This step will reflect your personality. Your mood board won’t be worth a dime if you hide it behind a door or inside a closet. It needs to be somewhere where you’ll see it frequently, preferably close to where your creative work happens. 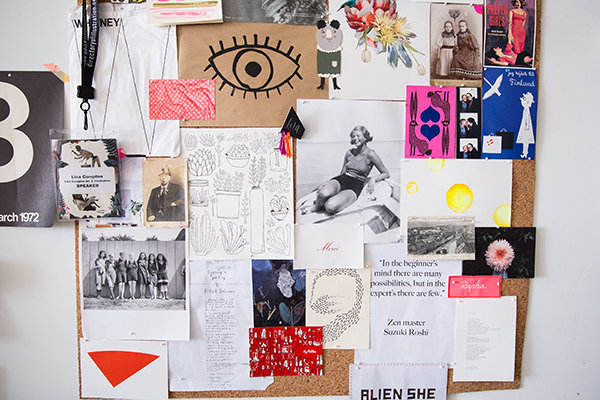 Before sketching or while dreaming up new ideas, the mood board is a wonderful tool for centering your creative ideas. 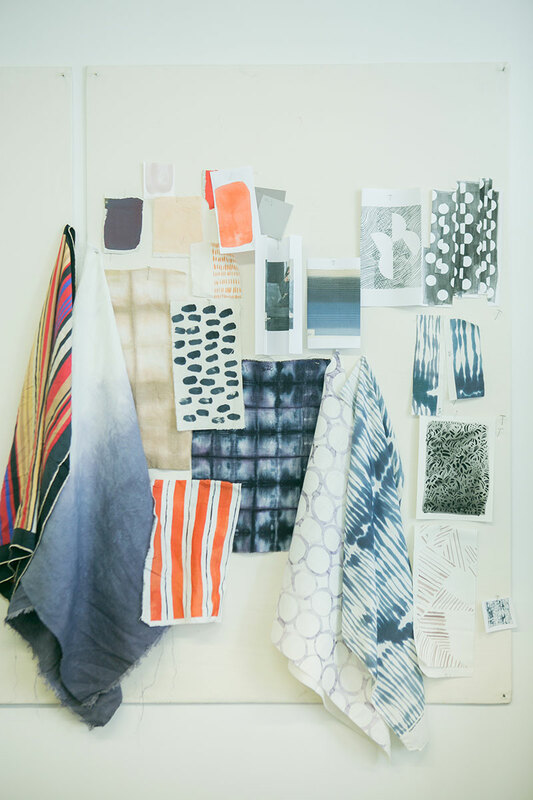 It will remind you of color choices, important words, or patterns that you want to incorporate into your work. 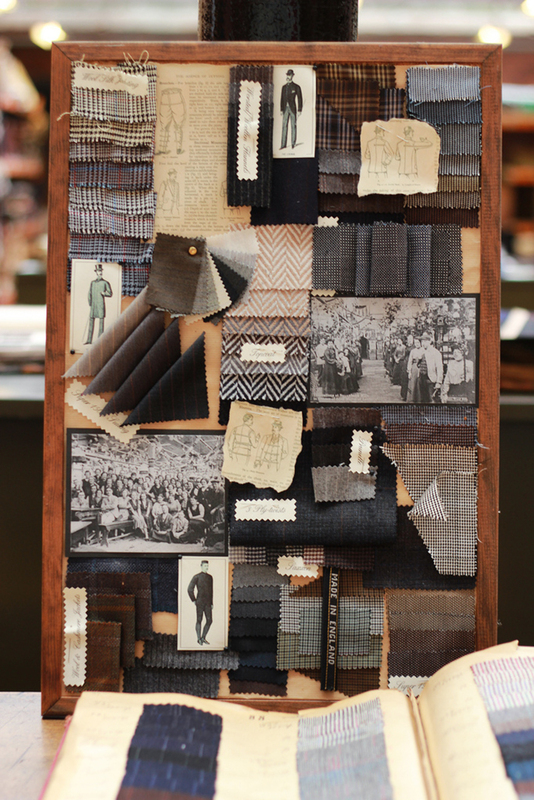 Over time we change and grow, and similarly your mood board should reflect your new ideas and inspiration. You might enjoy adding objects and images to it as you find them, or maybe you take time to change and refresh the board ever month. I keep a manilla file that’s filled with interesting tidbits and ephemera that strike my fancy. I like to go through this file periodically and pull things out that grab my current interest. A fresh board keeps the positive energy flowing. I like to frequent a rad ephemera and used book sale that’s held in the same complex as my studio, which is where I found the cool map of Butte Lake (below). I always have my eye out for things that hold meaning for me. Some of my new discoveries are glittery unicorn stickers, shiny gold printing paper with bumblebees, and smooth pieces of dried tempera paint. 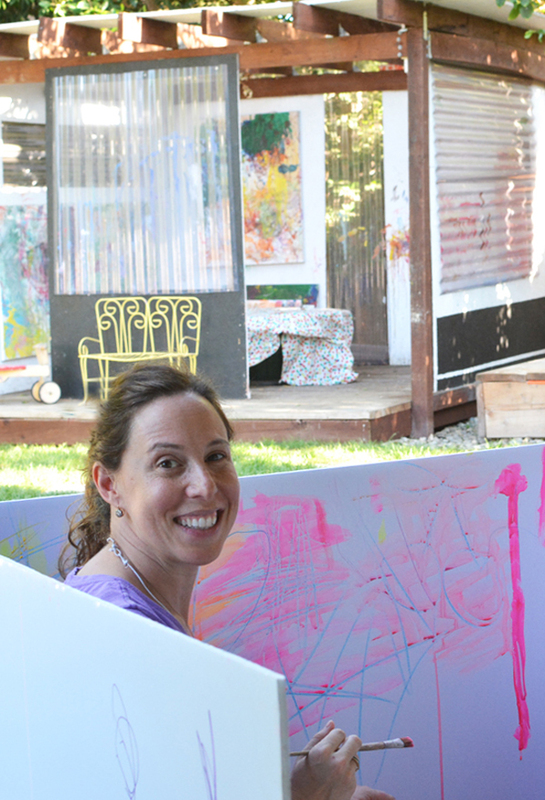 My Palo Alto, CA studio is my happy place to make art, tinker with my kids, run my business, and host workshops. 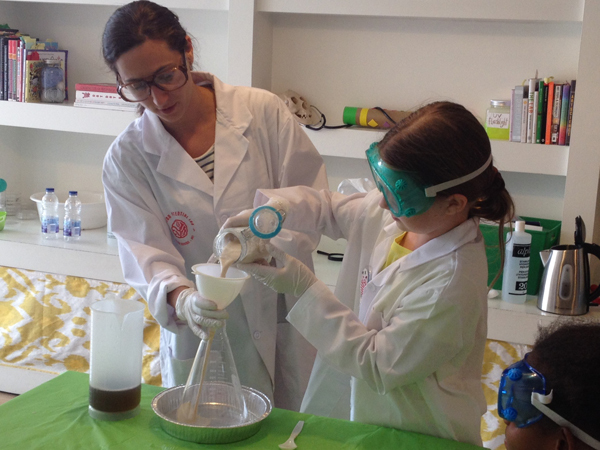 Check out the TinkerLab Event Page for details on our fun upcoming workshops and events. 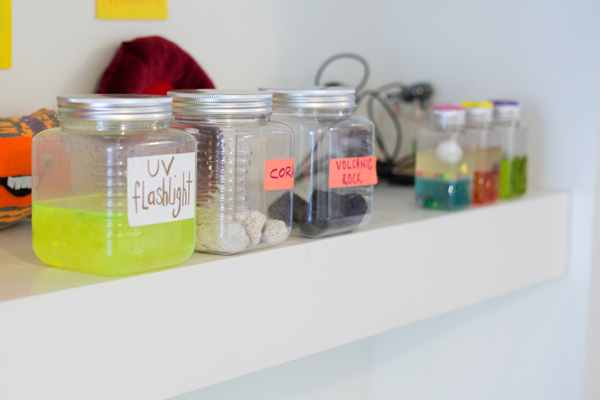 If you’d like to get inspired by creative workspaces for kids and adults, you’ll want to check out our Tinkering Spaces Series.